Join Us!!! We are looking for someone to help us cover WBAn basketball. Please send us an e-mail. WBA Teams ___________________ Bristol C. Jackson R. Kentucky R. Macon B. Raleigh K. Rome G. Southern C.L. Through 20 regular-season games, the Jackson Rage was the driving force behind the new World Basketball Association. On Saturday night, however, the Southern Crescent Lightning took over with the WBA championship game on the line. Both teams scrapped and clawed until the end. But the Lightning made 15 of 18 free throws in the final 1 minute, 22 seconds to claim an 82-79 victory before 5,206 — easily the biggest crowd of the season — at Jackson State's Williams Athletics and Assembly Center. Rage guard Detrick White hit two 3-pointers and a critical layup over the final 37 seconds, but Southern Crescent shot 81.3 percent from the charity stripe overall to walk away with the gold ball. It also helped that Southern Crescent guard Marcus Taylor, a Michigan State alum, caught fire in the fourth quarter. He scored 15 of his game-high 20 points during that span. "What happened was they made shots that they missed in the first half," Rage coach Richard Williams said. "We missed shots that we made in the first half. "When the game was on the line, Marcus Taylor just kind of took over, and he made some tough shots. That was the difference." The Lightning, who finished the season with a 16-6 record — 2-0 in the playoffs, got off to a slow start, thanks to an early scoring outburst by the Rage. 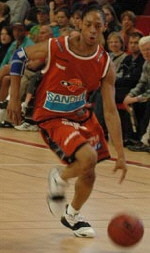 Rage guard David Sanders was the trigger man in the first quarter, knocking down three 3-pointers just five minutes into the contest. Rage center John Oden used a monster, two-hand dunk to ignite an 11-4 run to start the second. But the Lightning, which led the WBA in scoring during the regular season (93.0 points per game), closed the gap during the latter part of the second, going on an 11-5 run in the final 2 minutes, 58 seconds. The Rage, who led by as many as 13 in the first half, began to lose control after halftime. Southern Crescent outscored Jackson 14-3 during the first five minutes of the third. The Rage, despite making it close at the end, never seemed to recover from that run. "We've always been a second half team all year long," said Moss Point native and Lightning coach Litterial Green, voted WBA coach of the year. "They threw everything at us but the kitchen sink, and we were right there." Green said he was confident going into the game that his guys — a group of relative unknowns — would be able to topple league MVP Mario Austin and the Rage. "I had a funny feeling (about Saturday's game)," Green said. "The guys had a funny feeling. "We took it to them two straight times last month. I really felt like we came up on the short end of the stick. We won one and we lost by one." The Lightning had all five starters in double figure scoring. 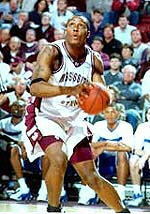 Former Ole Miss standout Derrick Allen finished with 19 points, Josh Powell 15, Shenard Long 12 and Lamont McIntosh 10. The Rage, meanwhile, got 18 point and 11 rebounds for Austin, who may have played his last game in a Rage uniform. Sanders added 17, White 14 and John Oden 13. The loss of starting guard Jason Parker left the Rage with some depth problems coming into the game. "We were concerned about our lack of depth at the guardposition, but Tim Henderson, I just told him how proud I was of him coming in and giving us some really good, sold minutes late in the year, making some big shots for us. "I'm really proud that I was able to spend two months with these guys. "They made coaching fun for me." The Rage, champions of the regular season, ended their first year with a 17-5 record. Milton Barnes - Commissioner (left) and Leroy McMath - President (right) lead the WBA to it's first season.